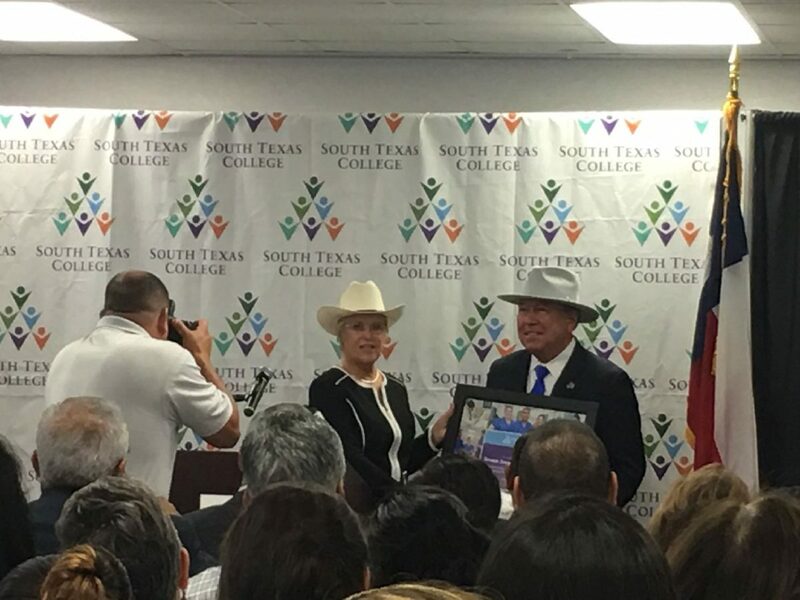 State Sen. Juan "Chuy" Hinojosa, D-McAllen, right, accepts a plaque from South Texas College Executive Officer for External Affairs Wanda Garza on June 26, 2017, as STC announces legislation passed during the 85th Legislature that will allow it to offer a baccalaureate of science nursing degrees pending approval from the Texas Higher Education Coordinating Board and Commission on Colleges of the Southern Association of Colleges and Schools. By all accounts that we’ve heard, the 85th Legislature was a particularly nasty session marked by much infighting, varying political agendas and little leadership in Austin. The stories are vast and varied but one thing repeatedly remains consistent: How the delegation from the Rio Grande Valley held together and supported one another. And for that, we’re told, the outcome resulted in the passage of several bills that will profoundly improve conditions in the Rio Grande Valley, as well as increased funding and programs for our local higher education institutions. Evidence of this became clear on Monday when South Texas College at a packed press conference proudly touted passage of a new law that will allow our local community college to offer baccalaureate of science nursing degrees (pending approval from the Texas Higher Education Coordinating Board and Commission on Colleges of the Southern Association of Colleges and Schools). The new law — passed on the last day of the session and signed by Gov. Greg Abbott earlier this month —will allow community colleges the legislative authority to offer up to three baccalaureate programs in the fields of applied technology, applied science, early childhood education and nursing. But because STC already offers four baccalaureate degree programs —technology management, computer and information technologies, medical and health services management, and organizational leadership — the Legislature, pressured by our local lawmakers, made an exception to allow STC’s current programs to be grandfathered in and to allow the institution the opportunity to also offer a bachelor of science in nursing degree program. “This is unique. And this will be the first time a community college would offer a bachelor of science degree,” Dr. Jayson Valerio, STC interim dean of nursing and allied health, told us. Indeed this college has proven itself time and time again to do so. And we applaud the STC administration for always pushing the envelope and seeking out future skill sets, often in the science fields and often many years before the need might be so obviously evident. The Institute of Medicine (formerly the National Academy of Medicine) recommends that 80 percent of all registered nurses attain a bachelor of science degree by 2020, however Texas is slow in meeting this. In 2010, only 48 percent of RNs had a bachelor’s degree and by 2016 only 57.5 percent had the added degree, according to the Texas Workforce Commission. Dr. Valerio said providing a pathway for higher education nursing degrees — which STC hopes to start in fall 2018 — should make it more likely for these RNs and those with associate degrees to pursue a bachelor’s degree. And this is important as Baby Boomers age and healthcare needs in our country rise. A federal report by the Health Resources and Services Administration projects by 2030 our country will need about 350,000 registered nurses but if the current passage rate of nursing students continues there could be a deficit of 60,000 full-time registered nurses at that time. Currently there is a shortage of about 15,000 nurses nationwide. Kathy Dassler, chief nursing officer of Rio Grande Regional Hospital, told the crowd that she needs upcoming nurses to take over for her as she plans to retire, and that hospitals, like Rio Grande Regional, will offer “tuition reimbursement programs” to help its nurses strive for advanced degrees. “Just go for it!” Dassler said. Just as our Valley lawmakers did this past session when they pushed, prodded and cajoled as a unified group to accomplish legislation, like this, that will uniquely help our South Texas communities. Congratulations to all who had a hand in this, including the City of McAllen, which donated land for the Allied Campus and recognizes the value of helping STC grow. As one of only three community colleges in Texas accredited by SACS and authorized by the Texas Higher Education Coordinating Board to offer baccalaureate degrees, an opportunity for affordable advanced nursing degrees should be a very real possibility for many more RGV families in the upcoming years.